"AoM" redirects here. For other uses, see AOM (disambiguation). A spin-off from the Age of Empires series, Age of Mythology takes some of its inspiration from mythology and legends of the Greeks, Egyptians, and Norse, rather than from actual historical events. Many gameplay elements are similar to the Age of Empires series. Its campaign follows an Atlantean admiral, Arkantos, who is forced to travel through the lands of the game's three cultures, hunting for a cyclops who is in league with Poseidon against Atlantis. Age of Mythology was commercially successful, going platinum four months after its release after selling over one million units. In 2003, it was followed by an expansion pack, Age of Mythology: The Titans. On May 8, 2014, Age of Mythology: Extended Edition was released for Windows via Steam. This was followed by a second expansion pack, Age of Mythology: Tale of the Dragon, released on January 28, 2016. In this screenshot, an Egyptian town under attack by the Norse, defending itself using the meteor god power. Like many other real-time strategy games, Age of Mythology is based on defeating enemy units and towns, building your own units and towns, and training villagers and fighters. In this way, players are able to defeat and conquer rival towns and civilizations. Players advance their tribe through four "Ages": starting in the Archaic Age, the player may upgrade to the Classical Age, the Heroic Age, and finally, the Mythic Age. Each upgrade to a higher Age unlocks new units and technologies for the player, which strengthens their settlement. However, upgrading requires a sum of resources to be paid and a certain prerequisite building to be constructed. There are three playable cultures in Age of Mythology: the Greeks, Egyptians, and Norse. Each culture has three "major gods"—important deities such as Zeus or Odin. The player chooses their major god before the game begins. Every time a player advances to the next age, a "minor god" is selected. Minor gods are slightly less significant historically than their major counterparts. Some minor gods include Bast and Aphrodite. All gods grant the player unique technologies, myth units, and a unique "god power"—A one-time special ability that can either damage an opponent, or benefit the player that uses it. There are four major resources in Age of Mythology: food, wood, gold, and favor; unlike previous games by Ensemble Studios, this game does not include the stone resource. Resources can be used to train units, construct buildings, and research technologies, among other things. Civilian units—namely, the Greek villagers, Norse gatherers and dwarfs, the Egyptian laborers, and fishing boats—are used to gather resources. Hunting animals, gathering berries, harvesting livestock, farming, and fishing are all methods by which food can be gathered. Wood is gathered only by chopping down trees, and gold is gathered from either gold mines or from trade. Players can purchase upgrades that increase the rate of gathering these resources. Favor is acquired in different ways by different cultures: Greek players gain it by having villagers pray at temples; Egyptian players earn it by building monuments; and Norse players receive it by fighting/hunting animals or by possessing heroes. Resources can be exchanged at a player's market, with the exception of favor. Every unit in the game takes up between one and five "population slots". Building additional houses or Town Centers—the main building in a player's town—increases the population capacity, up to a maximum of 300. Units can be classified into seven categories; infantry, archers, cavalry—the three of which are broadly classified as human units—siege units, naval units, heroes, and myth units (monsters and other creatures from mythology). The rock-paper-scissors model governs most units in battle. For example, infantry do additional damage to cavalry, cavalry do additional damage to archers, and archers do additional damage to infantry. The same rock-paper-scissors formation exists in the three different types of naval units—arrow ships, siege ships, and hammer ships. Siege units are generally exempt from the rock-paper-scissors model but are instead able to destroy buildings easily while being vulnerable to cavalry attacks. Heroes are extremely effective against myth units, which in turn do large amounts of damage against human units. Heroes are also able to collect relics, which grant the player additional economic or military bonuses when deposited in a player's temple. Most units can be upgraded, making them better at certain tasks. Buildings in Age of Mythology can generally be split into three categories: economic, military, and defensive. The most important economic building is the Town Center, which is similar to the building of the same name in the Age of Empires series games. Most civilian units are trained at the Town Center, as are some improvements. Most importantly, players advance Age via the building. The Town Center provides 15 population slots, and building additional houses will earn the player 10 additional slots per house. In the Heroic Age, players may claim settlements (unclaimed Town Centres) for additional population slots. In some cases owning all town centres will trigger a countdown to victory. Other economic buildings include the farm and market. Buildings are able to research improvements, as well as provide resources for the player. All units except civilians and myth units are trained at military buildings. These buildings differ in name and purpose between culture, but all are able to train similar units. Military buildings are also used to research military specific technologies, such as armor upgrades, and attack improvements. The Age of Mythology scenario editor: visible is a large statue surrounded by deep water and the "rotate camera angle" controls, which allow for construction of more complex custom scenarios. The Age of Mythology editor is far more advanced than that of its predecessor, the Age of Empires II scenario editor. As well as standard unit placement facilities, the editor allows units to be overlapped, and it facilitates for large mountains, and steep terrain. 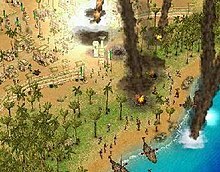 Triggers, a popular aspect of scenario design in Age of Empires II, are also present in Age of Mythology's editor, as well as cinematics and other special effects. Unlike the campaign modes in Age of Empires and Age of Empires II, Age of Mythology only has one central campaign, Fall of the Trident. The campaign is significantly longer than campaigns in previous games, with a total of 32 scenarios. Multiplayer is a highly popular aspect of Age of Mythology. Most multiplayer games are played through Ensemble Studios Online (ESO), or via a direct LAN or IP connection. Age of Mythology included unlimited free multiplayer accounts on ESO. As of December 2011[update] it is no longer possible to create new accounts but access to already created ones is still possible. Similar in function to Blizzard Entertainment's Battle.net, ESO allows players to play matches, as well as chat with other players. In multiplayer games, there are seven different game types available, all of which are provided as standard with the game: Supremacy—the standard game mode—includes randomly generated map and all gameplay aspects; Conquest is similar to Supremacy, but victory is only possible by defeating all other players; in Deathmatch players begin the game with high resources, but the game is otherwise the same as Supremacy; in Lightning, the gameplay is identical to Supremacy, but the game plays at twice the normal speed; in Nomad mode, players start with one civilian unit, and no Town Center, and must build up on a settlement; the goal of King of the Hill is to control a monument in the center of the map for a set period of time; and in Sudden Death, a player loses if their Town Center is destroyed, and they fail to rebuild it within a set period of time. Multiplayer tournaments and LAN parties are popular throughout the world, with many players visiting computer gaming lounges to participate. Atlantean admiral and war hero Arkantos arrives at Atlantis after several years of warfare to see his son, Kastor. However, he is ordered by the Atlantean councillor and theocrat, Krios, to sail to Troy to assist Agamemnon in the Trojan War. Just then, the island is attacked by krakens and the Black Sails, a group of pirate bandits led by the minotaur Kamos, a fierce enemy of Arkantos. After Poseidon's statue trident is stolen, Arkantos raids the pirate settlement on a nearby island, where he recovers the trident, although Kamos escapes on a leviathan and vows revenge. Arkantos sends the trident back to Atlantis and sails away, leaving Kastor behind against the latter's wishes. Arkantos travels to Troy to assist Agamemnon. After a series of skirmishes against Troy, fighting alongside Ajax and Odysseus, they devise the plan involving the Trojan Horse, and swiftly win the war. Afterwards, Ajax recommends Arkantos to sail to Ioklos to repair his ships, which are too heavily damaged for the trip back to Atlantis. When they arrive, the port has been raided by bandits, who have imprisoned the centaur Chiron. After rescuing Chiron, he reveals that the leader of the bandits is a man named Kemsyt. Chiron takes them north to locate the other prisoners, who are being forced to dig up an entrance to the underworld by Gargarensis, a cyclops warlord and commander of both Kemsyt and Kamos. The heroes destroy Gargarensis's base and confront him, but he escapes to the underworld of Erebus using the entrance. The heroes follow Gargarensis into the underworld, where they find him trying to burst open a large door in the stone with a huge battering ram. Cautious of his motives, they destroy the ram. Gargarensis confronts them and causes a cave to collapse before escaping, forcing the heroes to find another way out. With the help of the dead, they reach three temples dedicated to the Greek gods Poseidon, Zeus, and Hades. Arkantos prays to Atlantis's patron Poseidon for help but receives none. He then prays to Zeus, who creates a staircase to the surface. Ages before, the Earth was ruled by the Titans under Kronos. Zeus stopped Kronos and imprisoned him in Tartarus, behind adamantine doors. However, Poseidon, who is envious of Zeus's power, is trying to free Kronos and the Titans in order to destroy Zeus so he could claim the throne. Gargarensis is aiding him because Poseidon and Kronos have promised him immortality as a reward. Athena asks Arkantos to stop Gargarensis at all costs, as Zeus himself cannot interfere. In order to stop him, Arkantos travels with Ajax, while Amanra and Chiron go their separate ways to find the pieces of Osiris. Amanra goes north, where she finds Kemsyt's fortress on an island. With the aid of nearby villagers, she captures the piece he had stolen, but Kemsyt escapes. Chiron finds and recovers another piece hidden beneath a giant tamarisk tree, and is aided by Norsemen, who are trying to stop Ragnarok. Meanwhile, Arkantos and Ajax find the last piece in Kamos's main fortress. Arkantos raids the fortress, secures the piece, and mortally wounds Kamos with a spear, who falls to his death. The heroes gather all the pieces outside Osiris's pyramid, which protects another gate to Tartarus. Osiris is resurrected and defeats Gargarensis's army but the cyclops escapes, heading north to the Norselands, the location of another Tatarus gate. Following Gargarensis, Ajax and Arkantos find Odysseus's wrecked ship on the coast of an island, and so decide to land to look for him. Upon landing, both men are turned into boars by the sorceress Circe. They proceed to rescue Odysseus and his men, who have also been cursed, destroying her fortress in the process and reversing the curse. Odysseus continues his journey home, while Arkantos and Ajax continue north. When they reach the frozen Norselands, they are given directions to the underworld by dwarf brothers Brokk and Eitri in return for repelling giants from their forge. Later, an elderly man named Skult gives them a banner to unite the Norse clans. However, the Norsemen are instead enraged, and the heroes are forced to defeat their chieftains in combat. The flag turns out to be the banner of the evil giant Folstag and the plan a trick by Skult, who is actually the god Loki in disguise, another ally of Gargarensis. With the help of the valkyrie Reginleif, who sent the Norsemen to Egypt, the heroes locate Gargarensis and the Tartarus gate. Inside the Norse underworld Niflheim, they are pursued by fire giants until Chiron sacrifices himself to hold them giants off, saving his friends. While Gargarensis is trying to knock down the gate, Brokk and Eitri have been rebuilding Thor's hammer (shattered by Loki), that upon completion seals the gate. Back on the surface, they confront Gargarensis with the help of Odysseus, who has made a detour to help them, and the cyclops is captured and beheaded. Arkantos sails back to Atlantis. When he brings out Gargarensis's head to tie it to the mast in victory, he finds the head is actually Kemsyt's, another trick by Loki. Gargarensis is still alive and is trying to break the final gate holding Kronos, which is located at the centre of Atlantis. Gargarensis has captured and fortified Atlantis, and Poseidon himself has possessed a statue in the city center to protect him. Arkantos builds a wonder to Zeus and gains his blessing, giving him god-like power and enabling him to confront Gargarensis and the living statue at the temple of Poseidon. With his new powers, Arkantos defeats the statue, and Gargarensis is impaled by its trident as it collapses. All of Atlantis then collapses into the ocean, along with Arkantos. While the remaining heroes sail away with the surviving Atlanteans, Athena revives Arkantos and rewards him by making him a god. An official campaign, The Golden Gift, was released as a download on Microsoft's website. The campaign follows the adventures of Brokk and Eitri, the dwarves who appeared in the initial campaign. The plot unfolds with both dwarves planning to create a giant golden boar as an offering to the Norse god Freyr. While working separately, Brokk is approached by Skult (also from Fall of the Trident) who warns him that Eitri is making preparations to create the boar without his brother, of which Eitri is also told the same about Brokk. As both brothers race to complete the boar in the great forge, Skult steals the finished piece and holds it in Loki's fortress. The brothers eventually assault the base, and the boar is retrieved and successfully offered to Freyr. The official soundtrack was released on October 22, 2002, under the record label "Sumthing Else". The score was written by Stephen Rippy and Kevin McMullan. Rippy cites musicians such as Peter Gabriel, Tuatara, Bill Laswell, Talvin Singh and Tchad Blake as inspirations for the soundtrack. The musical work done on Age of Mythology was unlike anything Rippy had done before; an example of this was "writing for a seventy-piece orchestra and then flying out to Washington to record it". Age of Mythology: The Titans is an expansion to Age of Mythology, released on September 30, 2003. The expansion added a new culture, the Atlanteans, as well as several new units, including titans. Critics and fans received the expansion with enthusiasm, although its ratings were slightly lower on average than those of the original version. Age of Empires: Mythologies is a spin-off of Age of Empires: The Age of Kings, but with the unique mythology-based gameplay elements of Age of Mythology. It was developed by Griptonite Games for the Nintendo DS. Age of Mythology: Extended Edition is a compilation that includes the main game and The Titans expansion. It adds Steamworks integration, Twitch support, an enhanced observer mode, native HD widescreen and improved water and lighting. It was released on May 8, 2014. The Extended Edition was developed by SkyBox Labs. On September 18, 2015, a new expansion was announced, Tale of the Dragon. It was co-developed by SkyBox Labs and Forgotten Empires, the latter having worked on new expansions for Age of Empires II. The expansion added a new culture, the Chinese, with the major gods Fuxi, Nüwa, and Shennong. The expansion also features a new campaign and multiplayer maps, as well as other features. It was released on January 28, 2016. In the United States, Age of Mythology sold 870,000 copies and earned $31.9 million by August 2006, after its release in October 2002. It was the country's 10th best-selling computer game between January 2000 and August 2006. Combined sales of the game and its Titans expansion had reached 1.3 million units in the United States by August 2006. Age of Mythology received a "Gold" sales award from the Entertainment and Leisure Software Publishers Association (ELSPA), indicating sales of at least 200,000 copies in the United Kingdom. 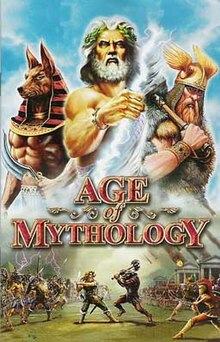 Age of Mythology received critical acclaim, reaching an estimated one million units sold within five months of its release. The game was nominated for the Academy of Interactive Arts & Sciences' Interactive Achievement Awards for Computer Game of the Year and strategy computer game of the year. Age of Mythology's graphics were praised by the majority of reviewers. IGN reviewer Steve Butts stated that "some fantastic effects and believable animations make this one a joy to watch. The differences between the armies and environments are awesome." As such, he gave the graphics a rating of 9 out of 10. Meanwhile, GameSpot reviewer Greg Kasavin also rated the graphics 9 out of 10, stating that "Age of Mythology is a great-looking game, filled with bright colors and carefully detailed animations." Game Revolution also appreciated Age of Mythology's graphics, stating in their review that the "new 3D landscape looks good", and including graphics as one of the positives in the review summary. PC Gamer reviewer William Harms admired the graphics, "The environments, units, and buildings are packed with detail," and excitedly commented on the effects: "What really impressed me, though, were the game's animations. When a Minotaur smacks a dude with his club, the schmoe goes flying, skids on the ground, and then bounces back into the air." The game's soundtrack was also praised by reviewers, although several commented that it was repetitive and predictable at times. IGN described it as "great, if repetitive, music", whilst Game Revolution declared that the sound "really showcases Ensemble's continued attention to detail", before going on to praise the audio snippets in various languages. IGN was pleased with Age of Mythology's campaign, and not bothered by its length. Instead, they stated that "the meaningful and engaging single player campaign provides a nearly flawless experience." However, GameSpot was slightly critical of it, claiming that "while some of the campaign missions do feature some unusual circumstances or objectives that change, the game's story isn't incredibly engaging." This was compromised by stating that Age of Empires fans wouldn't expect an amazing campaign; they would "make a beeline for the game's random map mode, anyway." PC Gamer elaborated more on the campaign however, saying: "many of the missions are extremely well-crafted", and that "sprinkled throughout these encounters are moments of genuine comedy — a truly delightful surprise." However, they still found reasons to criticize: "Regrettably, most of AoM's missions suffer from one recurring, frustrating problem: a severe case of 'build base-itis.'" The reviewer elaborated: "I know base-building is inherent to the genre, but even the most ardent fan will be put off by just how much there is. What's most disappointing is that AoM's setting really lends itself to imaginative mission design — and I don't think the designers took full advantage of the backdrop, which is a shame." The editors of Computer Games Magazine named Age of Mythology the fourth-best computer game of 2002, and called it "an amazingly well-balanced game, both in terms of its pacing and its mix of standard historical and fantastical units". It was a nominee for PC Gamer US's "2002 Best Real-Time Strategy Game" award, which ultimately went to Warcraft III: Reign of Chaos. Age of Mythology's artificial intelligence (AI) was used by four Austrian researchers—Christoph Hermann, Helmuth Melcher, Stefan Rank and Robert Trappl—in a study into the value of emotions in real-time strategy games. According to the abstract, "We were interested whether incorporating a simple emotional model to an existing bot-script improves playing strength." The results of the study determined that of the four bots they tested, the neurotic bot was most capable of defeating Age of Mythology's default AI, followed by the aggressive one. Neither bot was defeated by the standard AI, but the neurotic bot won, on average, twenty five percent more rapidly. Plans were made to extend the research in the future by pitting the neurotic bot against a human player. ^ "System Requirements". Microsoft Game Studios. Archived from the original on October 11, 2007. Retrieved October 4, 2007. ^ a b "Age of Mythology on MacSoft Games". MacSoft. Archived from the original on May 19, 2007. Retrieved June 4, 2007. ^ a b c "MobyGames Age of Mythology Info". MobyGames. Archived from the original on May 7, 2007. Retrieved July 20, 2007. ^ "Age of Mythology civilizations on MacGamer.net". MacGamer.net. Archived from the original on September 28, 2007. Retrieved May 11, 2007. ^ Kasavin, Greg (November 1, 2002). "Age of Mythology review". GameSpot. CBS Interactive. Archived from the original on October 10, 2008. Retrieved October 3, 2008. ^ Fahey, Rob (December 10, 2002). "Age of Mythology". Eurogamer. Archived from the original on March 15, 2009. Retrieved May 26, 2007. ^ a b ""Age of Mythology" Goes Platinum With More Than 1 Million Units Sold". News Center. Microsoft. March 11, 2003. Archived from the original on April 11, 2016. Retrieved July 22, 2007. ^ "Apple Games page on Age of Mythology". Apple Inc. Archived from the original on June 22, 2007. Retrieved July 4, 2007. ^ Burrell, M. "Age of Mythology Review - GamersHell.com". GamersHell. Archived from the original on April 5, 2007. Retrieved April 20, 2007. ^ "Age of Mythology page on Ensemble Studios Website". Ensemble Studios. Archived from the original on June 9, 2007. Retrieved June 4, 2007. ^ "Age of Mythology Heaven Hersir info". Age of Mythology Heaven. Archived from the original on November 13, 2006. Retrieved June 5, 2007. ^ a b c d e f "Buildings on MacGamer.net". MacGamer.net. Archived from the original on July 12, 2007. Retrieved June 4, 2007. ^ a b Kasavin, Greg (November 2, 2002). "GameSpot review on Age of Mythology". GameSpot. CBS Interactive. Archived from the original on June 5, 2007. Retrieved June 4, 2007. ^ "Greek Hero Units". Age of Mythology Heaven. Archived from the original on March 5, 2012. Retrieved June 5, 2007. ^ "Relics page on Age of Mythology Heaven". Age of Mythology Heaven. Archived from the original on October 30, 2006. Retrieved May 4, 2007. ^ "Age of Mythology Heaven Unit Guide". Age of Mythology Heaven. Archived from the original on November 13, 2006. Retrieved June 5, 2007. ^ "Elevation in Scenario Editor". Age of Mythology Heaven. Archived from the original on November 12, 2006. Retrieved June 4, 2007. ^ "Scenario Editor Glossary". Age of Mythology Heaven. Archived from the original on October 30, 2006. Retrieved June 4, 2007. ^ "Age of Mythology for PC". ToTheGame. Archived from the original on October 29, 2007. Retrieved October 6, 2007. ^ "Ensemble Studios Online (ESO) FAQ". Age of Mythology Heaven. Archived from the original on October 30, 2006. Retrieved July 22, 2007. ^ ES_Bigdog. "How many game modes are there in AoM?". Age of Mythology Heaven Forums. Archived from the original on January 11, 2016. Retrieved July 22, 2007. ^ "What games can I play in competition?". Uptime Games. Archived from the original on October 12, 2007. Retrieved October 4, 2007. ^ Amer Ajami (January 31, 2001). "Ensemble Studios Interview". GameSpot. CBS Interactive. Archived from the original on March 6, 2009. Retrieved July 24, 2007. ^ Stuart Bishop (August 19, 2002). "Interview: Rock of Ages". C&VG. Archived from the original on July 8, 2007. Retrieved July 24, 2007. ^ "Age of Mythology announced". GameZone Online. Archived from the original on August 19, 2004. Retrieved April 27, 2007. ^ a b "Age of Mythology Trial". Age of Mythology Heaven. Archived from the original on November 13, 2006. Retrieved April 29, 2007. ^ Street, Greg T. (August 21, 2002). "Age of Mythology: Volume II". GameSpy. Archived from the original on October 12, 2007. Retrieved April 29, 2007. ^ Street, Greg T. (September 5, 2002). "Age of Mythology: Volume III". GameSpy. Archived from the original on May 7, 2006. Retrieved April 29, 2007. ^ "Age of Mythology Soundtrack CD". CD Universe. Retrieved July 23, 2007. ^ Steve Butts. "Age of Music". IGN. Archived from the original on April 11, 2016. Retrieved July 6, 2016. ^ "Age of Mythology". Jay Semerad. Music 4 Games. Archived from the original on October 12, 2007. Retrieved October 4, 2007. ^ "Age of Mythology: The Titans Info". MobyGames. Archived from the original on January 15, 2006. Retrieved January 14, 2008. ^ "Age of Mythology:The Titans GameRankings page". GameRankings. Archived from the original on April 13, 2016. Retrieved July 6, 2016. ^ Daemon Hatfield (June 2, 2008). "A sequel to Age of Kings is on the way". IGN. Archived from the original on August 20, 2016. Retrieved July 6, 2016. ^ Yin-Poole, Wesley (3 April 2014). "Age of Mythology Extended Edition out in May". Eurogamer. Gamer Network. Archived from the original on April 5, 2014. Retrieved April 3, 2014. ^ "Age of Mythology: Extended Edition". Steam. Valve Corporation. Archived from the original on May 30, 2014. Retrieved 30 May 2014. ^ "Age of Mythology: Extended Edition HD". SkyBox Labs. Archived from the original on August 4, 2014. Retrieved July 22, 2014. ^ Cysion (September 19, 2015). "Age of Mythology: Tale of the Dragon announcement" (Press release). Forgotten Empires. Archived from the original on September 20, 2015. Retrieved September 21, 2015. ^ "Tale of the Dragon Expansion Pack Central". HeavenGames LLC. January 4, 2016. Retrieved January 14, 2016. ^ "Age of Mythology Reviews". GameRankings. Archived from the original on April 25, 2016. Retrieved July 6, 2016. ^ "Age of Mythology (pc: 2002): Reviews". Metacritic. Archived from the original on July 9, 2016. Retrieved July 6, 2016. ^ Brogger, Kristian (December 17, 2002). "Game Informer review". Game Informer. Archived from the original on December 12, 2007. Retrieved December 6, 2007. ^ a b c "Age of Mythology". Game Revolution. Archived from the original on March 5, 2007. Retrieved October 5, 2007. ^ Butts, Steve (November 4, 2002). "IGN Review". IGN. Archived from the original on June 29, 2016. Retrieved July 6, 2016. ^ a b c William Harms. "PC Gamer review". PC Gamer. Future plc. Archived from the original on October 12, 2007. Retrieved October 6, 2007. ^ "6th Annual Interactive Achievement Awards". The Academy of Interactive Arts & Sciences. Archived from the original on September 29, 2007. Retrieved July 22, 2007. ^ a b c Steve Butts. "Age of Mythology review". IGN. Archived from the original on January 11, 2016. Retrieved July 6, 2016. ^ a b Greg Kasavin. "Age of Mythology Review, Page 3". GameSpot. CBS Interactive. Archived from the original on March 6, 2009. Retrieved July 22, 2007. ^ "Neuroticism – A Competitive Advantage (Also) for IVAs?". Lecture Notes in Computer Science. SpringerLink: 64–71. doi:10.1007/978-3-540-74997-4_7. Retrieved October 11, 2007. ^ a b "Neurotic software has a winning personality". New Scientist Technology Blog. October 5, 2007. Archived from the original on October 11, 2007. Retrieved October 11, 2007.